This is major milestone, not only for Bellefield, but for legal technology. Bellefield Systems, LLC, the leader in mobile time entry for firms of all sizes, announced today a “wearable” version of its flagship product, iTimeKeep, for the Apple Watch. iTimeKeep for the Apple Watch is a first-of-its-kind App for the legal industry. iTimeKeep for the Apple Watch represents a new era in legal technology. Attorneys can now enjoy the convenience of entering their time from their wrists by simply using their voice. Bellefield is redefining timekeeping as we know it. Better timekeeping is now possible, making it more convenient than ever before for attorneys to practice contemporaneous time entry, which increases billing accuracy and leads to increases in revenue for law firms. Wearables, such as the Apple Watch, will play a major role in the future of Mobility. Bellefield is excited to continue pioneering the path of innovation in the legal technology space through its App for wearables, such as the Apple Watch, which was introduced and demonstrated in June at the Thomson Reuters Elite/Vantage Conference in Vegas. “Attorneys can now accurately record their time hands-free in a few seconds without needing their smartphones in hand. This is a major milestone, not only for Bellefield, but for legal technology, as we continue our relentless commitment to removing roadblocks to time entry. iTimeKeep for the Apple Watch allows us to deliver on our promise to attorneys to make time entry simple and convenient at any time, anywhere, using any device,” said Gabriela Isturiz, Co-Founder and President. iTimeKeep for Apple Watch will be available in the App store this fall and is part of a comprehensive release of new iTimeKeep features. Bellefield continues its commitment to innovation and mobility, driven by the purpose to create Apps that enable attorneys to work the way they want to work. 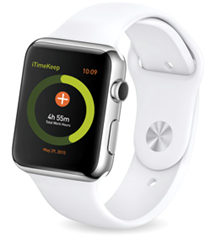 You can learn more about iTimeKeep for the Apple Watch here. The TEaaS model, pioneered by Bellefield, is constructed to be laser focused on the things that matter to the modern law firm: encouraging contemporaneous time entry and making it as simple as possible for everyone involved. The TEaaS model allows firms and their users to be up and running in a few hours without taxing the resources of the law firm with costly hardware and software and complex implementations. Bellefield’s TEaaS model is transforming the way the modern law firm works. Bellefield is committed to helping lawyers improve their work lives by developing innovative and intuitive applications that solve real-world challenges. Bellefield does this by identifying a problem, evaluating it from many different perspectives, and working tirelessly to create the best possible solution. Bellefield’s flagship product iTimeKeep ranks #1 as the most adopted Mobile Time Entry solution for attorneys for the second consecutive year. Additionally, Bellefield was recently ranked #5 in the Pittsburgh Top 100 Fastest Growing Companies. Founded by software veterans Gabriela Isturiz, Daniel Garcia, and John Kuntz, Bellefield is an independent, privately held company headquartered in Pittsburgh, Pennsylvania. To learn more, visit Bellefield Systems.